Lakeside 7120 Heavy-Duty Stainless Steel Two Shelf Ergo-One System Utility Cart - 41 3/8" x 21 5/8" x 46 3/4"
Designed with the help of an orthopedic specialist to prevent body strain and combat worker's comp expenses, the Lakeside 7120 stainless steel two shelf Ergo-One system utility cart is an essential and practical addition to your foodservice operation. This item boasts two 21" x 33" 14 gauge stainless steel reinforced shelves and an 18 1/2" clearance, which meets Lakeside's "safety zone" requirements for the proper height for loading and unloading. Additionally, a vertical handle with comfortable grip ensures wrists are in the correct position for effortless pushing and steering. All the joints are fully welded to better withstand heavy loads and frequent use, while the stainless steel construction allows for easy cleaning and sanitation. Two small and two large casters are fitted with no-mark, extra-load cushion tread wheels that absorb impact and reduce vibration. For further assistance, integrated leg bumpers protect both walls and furniture. 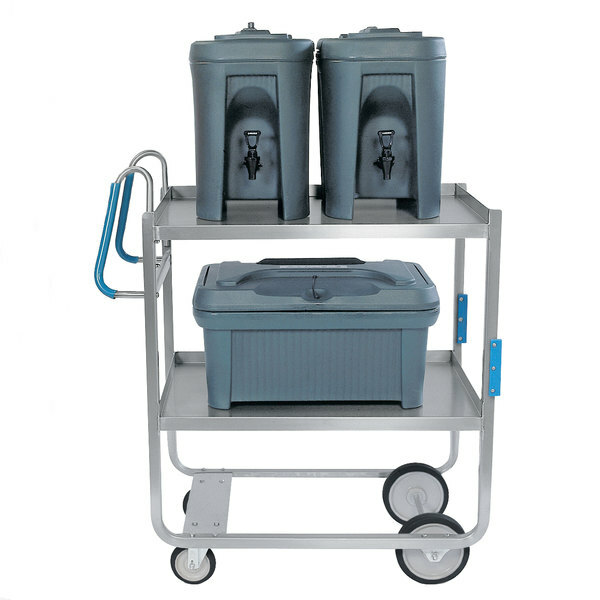 The Lakeside 7120 utility cart is recommended for heavy-duty use and features a 1000 lb. weight capacity.